Since 2004, swimming in the United States has experienced a notable bump in participation each year following the Summer Olympics. Swimming journalists started to call the phenomenon the ‘Michael Phelps Effect’, for the unparalleled success of Michael Phelps in the 2004, 2008, 2012 and 2016 Olympic Games. High School and club participation has seen steady growth over that time too, but perhaps most importantly, the ability to swim has been increasing. In 2017 the USA Swimming Foundation announced a 5-10% increase in swimming ability among U.S. children, but emphasized the amount of work to be done as 64 percent of African-American children, 45 percent of Hispanic/Latino children and 40 percent of Caucasian children have no or low swimming ability. The ability to swim is an important survival skill, as well as a life-long health and wellness benefit. Designing a comprehensive, flexible and inclusive swimming facility for your school district can help to increase swimming ability and participation in your community. Constructing and operating a natatorium is a significant investment for a school district and community. A well-designed venue will support year-round activities—from competitive swimming and diving to open swimming, community lessons and aquatic therapy. To maximize long-term value, it’s important to bring all interested groups together to plan a facility that will maximize enthusiasm and participation. Every owner will have to determine which requirements are the most valuable to their athletes, community and long-range goals. 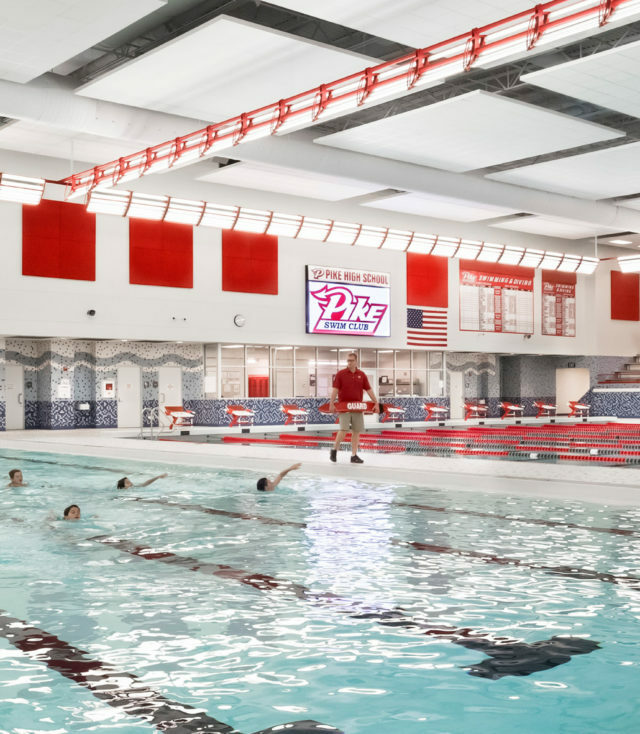 The Pike High School Natatorium is designed for flexibility, allowing multiple instructional programs to be conducted simultaneously. The biggest decision will be the size of the main pool. The standard high school pool is 25 yards with six to eight lanes, but the National Federation of State High School Associations recommends eight lanes as a minimum. For club swimming, events are measured in 25 meter and 50 meters, with 8 lanes as a minimum. The recommended lane width can vary, but most high school facilities feature seven-foot lanes, which comply with the National Federation of State High School Associations and USA Swimming guidelines. For pools designed to accommodate yards and meters, moveable bulkheads are used to divide the pool and adjust the course length. Spectator seating should be separated from access to the pool deck. Many design solutions tuck the locker and shower rooms under the seating tiers, which allows a safe swimming environment for the athletes and a commanding view of the pool for spectators. Also consider providing prominent views into the seating and pool area from adjacent concourse and public spaces. Visually connecting the natatorium can highlight activities and increase safety. Lighting is also a key component to creating a safe and enjoyable swimming experience. Windows and window walls with clear or transparent glazing can be designed to maximize daylighting without creating glare, which can be dangerous for swimmers. Lighting can be incorporated in traditional types of installations or tap into the expanding opportunities of LED fixtures. 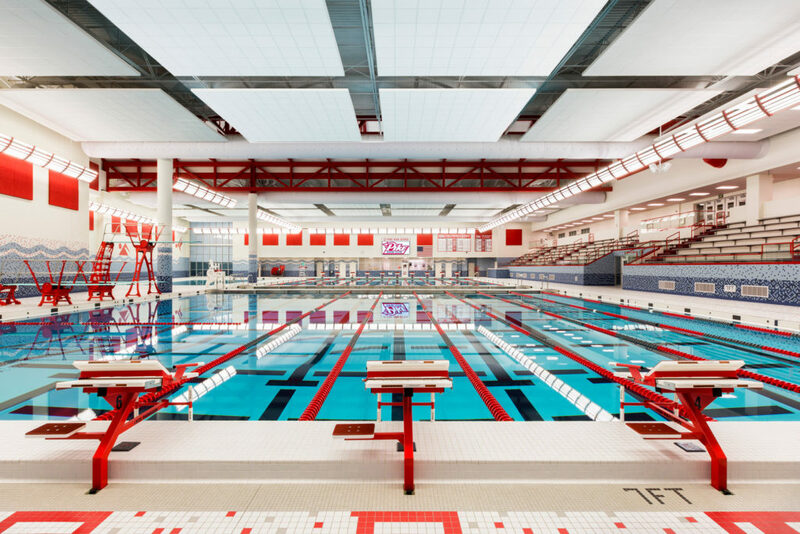 The interplay of water and light is a vitally important aspect of natatorium design. Throughout the development of the design, the model should be tested virtually by cycling through a year of sun angles to ensure success of the built design. The ability to swim is a skill that everyone should have. A year round, flexible pool facility can provide immediate and future opportunities to the expanding number of swimmers—both competitive and recreational. To that end, a well-designed natatorium will increase swimming ability, participation and community pride at your district.